I have two useful (and free) author tools to share with you today, courtesy of authors John Logsdon and MM Jaye respectively. I’ve often shared on this blog my support of Amazon. Despite its occasional missteps, the company has leveled the playing field for Indie authors and is busy changing the publishing industry on a daily basis. It is consistently client-centric in its approach and has invested heavily in making the shopping experience as pleasant and flawless as possible. Which is why I can’t fathom why it’s so hard for it to build a proper, user-friendly blurb builder. In effect, there are two separate ways of posting your blurb: the first is to do it through your book details on KDP. This has the benefit of allowing you to use some basic html tags; namely: <b><br><em><font><h1><h2><h3><h4><h5><h6><hr><i><li><ol><p><pre><s><strike><strong><sub><sup><u> and <ul>. However, it lacks any sort of preview. Then, there is Author Central. Posting a blurb through this is a breeze, especially since you can edit both print and Kindle editions with a single click. Also, it doesn’t require you to re-publish your entire book. However, and despite the presence of a formatting toolbar and previewer, it only allows you to add 3 kinds of formatting: bold, italics and lists. As <h2> is the tag that formats a text into the nice orange title font, this renders it useless for me. John Logsdon alerted me to the Amazon blurb preview, which allows authors to format their blurb using the tags acceptable on KDP. 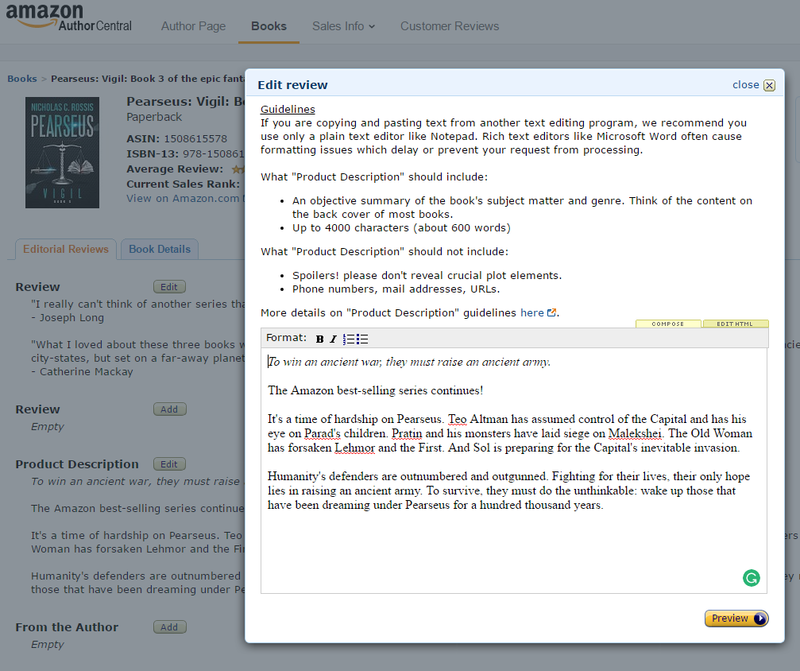 Basically, you type the text, format it using the available tags and copy/paste it into KDP. If the idea of using tags freaks you out, you could format your text in a WordPress post, go to Text (instead of Visual) and copy the code you find there. Paste it into the Amazon blurb previewer and presto-you’re done. I have often wondered if there might be a tool that would allow me to see which books Amazon connects to mine. Author MMJaye alerted me to a tool that does just that: Yasiv. If you don’t know it, it’s pretty cool. You just paste your book’s ASIN and it visually shows you all the Amazon books it’s connected with. Specifically, it shows which books it points at (meaning which books people navigated to and bought after visiting your book’s page) and which books point to your books. For obvious reasons, the older the publication (and the more promos you’ve run on it), the more the books which will point back and forth. Predictably enough, the busiest map results were for my first book to be published, Pearseus: Rise of the Prince, although it turns out that only 3 books point to it. You can use this tool to target books on Amazon Marketing Services (see tutorial): Yasiv orders linked books by popularity, so you should make sure to include the top ones in the list of books that you target. If you have any other favorite tools of yours that you’d like me to feature, just let me know and I’ll post about them! Great information. How do you get books to link to your page? I found I have 0 connections. That can’t be good. wonder if that means those people that bought my book haven’t bought any other books from Amazon. Do you think that is what no connections means? I doubt it. It’s more likely that Amazon has a threshold number, above which is starts displaying connections. Oh, yes, that makes sense. Once again, thanks to Nicholas Rossis for sharing some very useful tools. These are both new to me, and I plan to download TODAY! Check it out! Thank you for sharing both of these, Nicholas! Like you, I am very supportive of Amazon, and in general, find them a pleasure to work with. I’d never be doing what I am today, if it weren’t for the opportunities they’ve offered me, so I’ve learned to live with any eccentricities. Also, like you, I’ve been frustrated with the blurb writing experience. I can’t wait to try out this preview tool. And Yasiv sounds like it will be very useful, too. Now, when you find a tool that helps drill down through the categories to a sub-category more suited to an author’s particular book, please pass that along, as well. Trying to do it on my own isn’t working well, and it would be lovely not to have to contact Amazon each time I want to get more specific. In the meantime, I appreciate everything you share here, and I’ve reblogged this so the good folks on The Write Stuff can take a look at Yasive and the Blurb Previewer, too. Thanks, again! I use an Excel spreadsheet for categories. You can download it for free from http://nicholasrossis.me/2016/03/04/how-to-use-amazon-categories-to-increase-your-rankings/ (or just click on http://nicholasrossis.com/uploads/AmazonCategories.xls to skip reading the post). I was wondering whether I should explain how to use html tags; then I realized it’s so much easier if you use WordPress instead! I’ve been MIA and sorry because you always have such great information. I have to stop writing for a while and come up for air. Thanks, Nicholas. Author Nicholas Rossis provides us with an excellent post about Free Author’s Tools, Blurb Preview and Yasiv. Thank you for this helpful information, Nicholas. We appreciate your efforts! Very useful blog Nicholas. However, do you know anywhere I can find the meaning of those mysterious html tags? They are meaningless to me. That’s probably the case for many people. That’s why I suggested you simply format in WordPress, then go to the Text view (instead of the Visual one) and copy everything you find there: the html tags will be included. Hi again Nicholas. I came back to this post because I’m putting together a reblog for it. But I forgot to ask you, I was told a long time ago that once we fiddle with our blurb on Author Central, we can’t change anything in description anymore from our KDP bookshelf controls, so that would render the copy/paste method not a viable method to change descriptions and tags once we’ve tinkered with on Author central?